I was recently contacted by the always awesome Udi from diyphotography.net, and I was delighted when he sent one of his Bokeh masters kit in my direction to review. 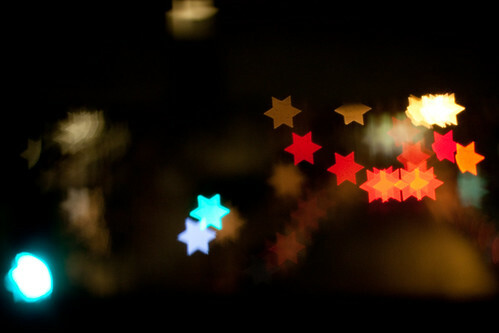 Star shaped bokeh from out-of-focus traffic downtown. The basic idea of the kit is put a cutout shape in front of the camera lens, which shapes out-of-focus lights using the shape on the cutout [Optics nerd time: I'm not sure of the exact optics going on here, but what I'm guessing is that it masks the circle of confusion formed at the image plane with the cutout shape. Someone please correct me here if I'm wrong]. Udi took the idea of his DIY shaped bokeh and turned it into a product where you can swap in one of a number of pre-made cutouts. The masters kit comes with five pre-perforated sheets. 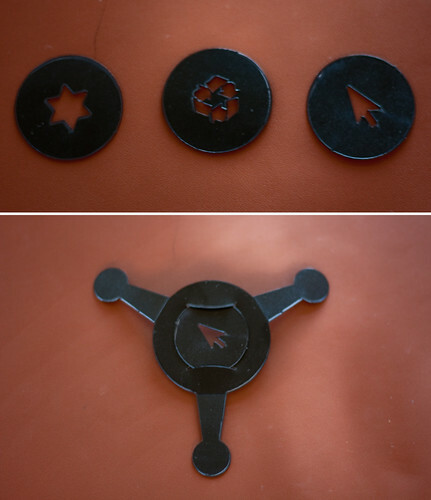 Four of these contain the shaped cutouts, and the actual 'bokehtinator', which is used to mount the discs. Another sheet folds into a little box for storing the discs when they are not in use. A rubber-band is supplied so you can attach the bokehtinator to the camera itself. When you first punch the discs out, you might get a feeling that the plastic is a bit on the flimsy side; in particular the folds bokehtinator seem like they might tear. However, after a two days of of testing I was pleasantly surprised to find that by just being mindful of not pulling along the fold lines it is indeed quite sturdy. Attaching the bokehtinator is relatively simple - the tabs are folded around the lens and held in place with the rubber bands. A clever part of this design means that the focusing ring is still accessible for use, as opposed to the DIY cap-based designs which would prevent this. One thing that I quickly discovered was that I needed to attach the bokehtinator with a good 5mm gap away from the end of the lens to allow room for the focusing mechanism to work. I used my trusty Canon 450D along with a f1.8 50mm nifty fifty. 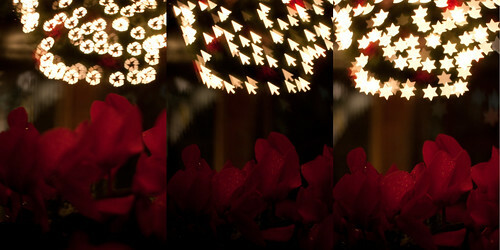 To really make use of the bokeh effects, you need out-of-focus light sources. If your lens has a good, big depth-of-field than you might be disappointed - as the instructions in the kit say, for this to work you need the aperture wide open (i.e. low f-stop). The sweet-spot for usage (as I understand it) is with portrait photography with a backdrop that has point light sources. As is sometimes the case for portrait photography, you need to get in close for it to work, or alternatively settle for blurring everything out to get the effect. In the shot above I've taken a photo of a building downtown. Unless I got really close to the building, it was going to be pretty unlikely that I was going to get only part of the building in focus (custom lenses aside). However, if you throw sharpness out of the window, you can still get an interesting looking shot. By turning off autofocus and manually racking the focus back and forth, you can experiment with exactly how big you'd like the effect to be. 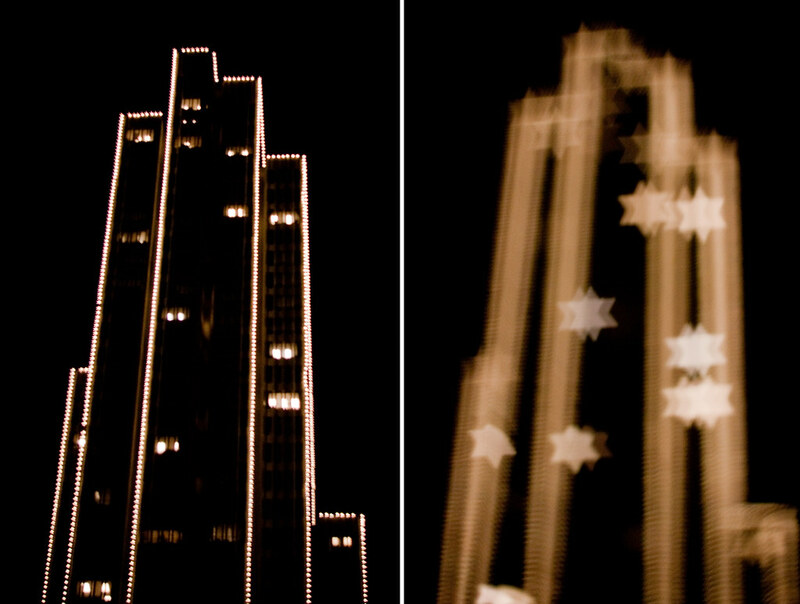 In the example above, we start off with relatively small shaped bokeh, but a nice sharp foreground. As the focus is racked, we get bigger, more impressive looking bokeh but the foreground goes out of focus. To see how it affected the technical aspects of shooting, I tested with three representative cutouts. 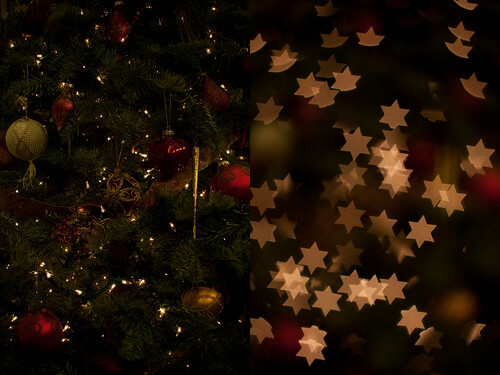 I used the star, which provided a relatively simple shape and large aperture. The recycle symbol had a lot of detail and a smaller aperture, and the cursor symbol had and off-centre aperture. The first thing that I found was that the multi-point autofocus no longer worked with the bokehtinator in place. This wasn't a big deal; I set the autofocus point to the centre of the image, which seemed to work fine for the star and the recycle, but wouldn't work at all for the cursor cutout. 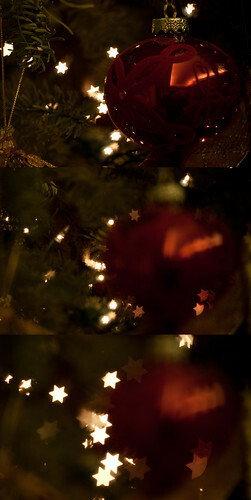 I also got mixed results with metering. I prefer to use centre-weighted metering (in aperture priority mode) on my camera, which worked fine with the star and recycle discs, but tended to over-expose with the cursor. 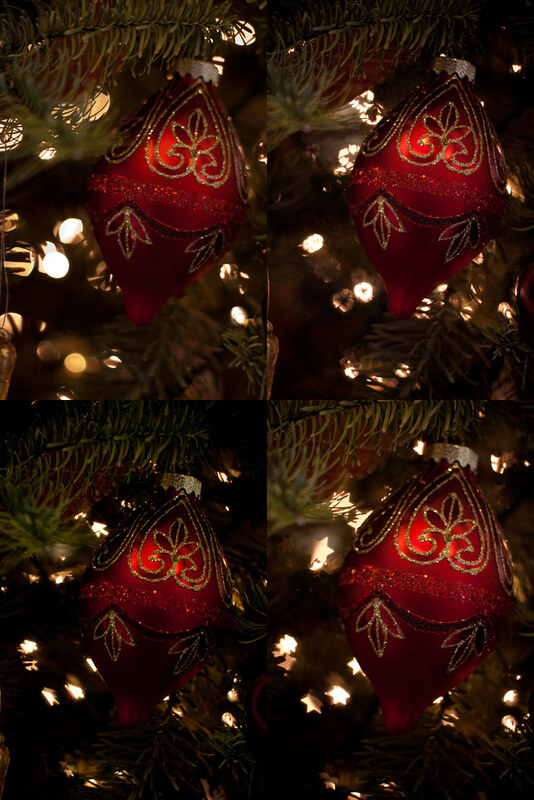 Once you get the camera set-up though, it's a bunch of fun. This is a great time of year to be playing around with this particular accessory as there are lots of seasonal decorations to give you point sources for your bokeh. The shaped bokeh is sharp - in particular, I do like how it turns otherwise plain-old background bokeh into sharp shapes, which (when the composition works) match a sharp foreground subject. I was also initially a bit doubtful about the sharpness of the cutouts when I first looked at the discs, but I'm happy to report that this wasn't a problem. One could easily argue that given the relatively simple nature of the kit, that you could build your own at home. If you're the kind of photographer that can do that, more power to you, but I'd say that then this isn't the kit for you. My feeling is that this kit is aimed at the photographer who just wants to get going with shaped bokeh and doesn't have the time or inclination to craft small cutouts. It'd also make an awesome tool for portrait photographers who are looking to differentiate their work. As cheesy as it sounds, the provided good selection of cutouts means that you can quickly pick one out that suits the occasion. In practice, I found that my shooting tended to consist of taking a few test shots on auto-metering and auto-focus, and then switching to both manual mode (for shutter speed) and manual focus. You also need to be mindful of the depth of field of the lens that you are using, and how a careful choice of both subject and distance from the camera will affect the result. As such, I don't think this kit is for the total beginner - however, I think an intermediate to advanced photographer would get a lot out of it. If you fit into one of these categories, I'm going to go ahead and cheerfully recommend it.